Employee referrals are arguably one of the oldest and widely used recruitment channels. This method has stood the test of time for good reason. Research has found that these candidates have a higher retention rate, bring in more profit and can save organizations money throughout the hiring process. The study divided participants into “winners” (those finding filling vacancies easy) and “strugglers” (those finding filling vacancies difficult). To find out if you’re a “winner” or a “struggler” download the report. As you can see in the chart below the most important recruitment channel used by both winners and strugglers was employee referrals. 94 percent of winners said that they currently use this method. A lower 83 percent of strugglers said the same. Where things get interesting is that despite a lower usage of employee referrals, strugglers attribute a hefty 40 percent of their best candidates to this practice. This is an 11 percent disparity between the 29 percent of winners who felt their best quality candidates were reached this way. Why is there such a vast difference? We all know that an employee referral is like gold, but they’re also low volume. It makes sense that the winners are a) investing more in that channel to up the volume; and b) doing things to increase the effectiveness of other channels in bringing in higher quality candidates, if that’s what’s happening. Elsewhere in the survey, we found that winners differed in how they used social media in their recruiting. 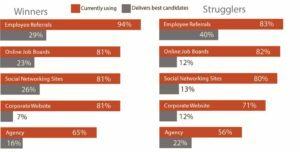 It appears as though the winners are more likely to be spending time engaging their employees to help them connect with, and nurture passive candidates, and targeting those same candidates with specific ad strategies to reach them. This probably suggests that they are moving their employee referral efforts into the social media realm. Winning HR professionals also said that their hiring managers are more engaged and have the skills to properly assess candidates. Two-thirds of winners are trying to figure out ways to measure those with the appropriate cultural fit, ideal personality and temperament through behavioral assessment tools. So what does this tell us? The general consensus is that employee referrals are a valuable tool to recruit quality candidates (such as engineers). Companies need to work towards getting more referrals from employees, especially through social media. Once they do attract those candidates, they need to have a program in place to nurture them. If you are an HR professional or hiring manager, how do you engage candidates in the hiring process? Do you find success in employee referrals? Do you feel as though you are winning or struggling in the hiring process? Ian Cameron is the Managing Director of The McQuaig Institute. For over 50 years, The McQuaig Institute has been providing a simple, accurate system that empowers companies to hire, retain and develop the right people the right way.